True Parents asked us to return to the beginning when our church started with a mindset to “become one with divine spirit and truth.” Based on these words, there was great success with the participation of 242,000 members from 132 countries, by the end of Dec., 2018. We can now say that we have entered the golden age of True Parents’ direct dominion. True Parents blessed the land of Korea as Heavenly Korea (HK), and on Dec. 17, 2017, True Parents appointed Pres. of Cheongpyeong Heaven and Earth Training Center (CPTC), Pres. Gi-seong Lee, and more members visited the CPTC. The 6th year of Cheon Il Guk (CIG), 2018 was a year that we made our relentless efforts to accomplish our mission as heavenly tribal messiahs (HTMs), to bless 430 couples horizontally and 430 gen. of ancestors vertically. In particular, on Aug. 30, 2018, True Parents issued guidelines to establish branches of the CPTC so that we can take responsibility for our missions as HTMs; they said that these branches should be established in 4 regions: Heavenly Africa, Heavenly Europe, Heavenly Latin America, and Heavenly Asia. ﻿ On Feb. 22, the 2018 RRHMF for a HK was held on the 3rd day of the CP GW Commemorating the 5th Anniversary of FD with True Parents; many leaders from other fields, blessed families (BF) and ambassadors for peace attended. The RRHMF for a HK began with the members offering Hyojeong Offering Papers (HOPs) and chanyang. Pres. 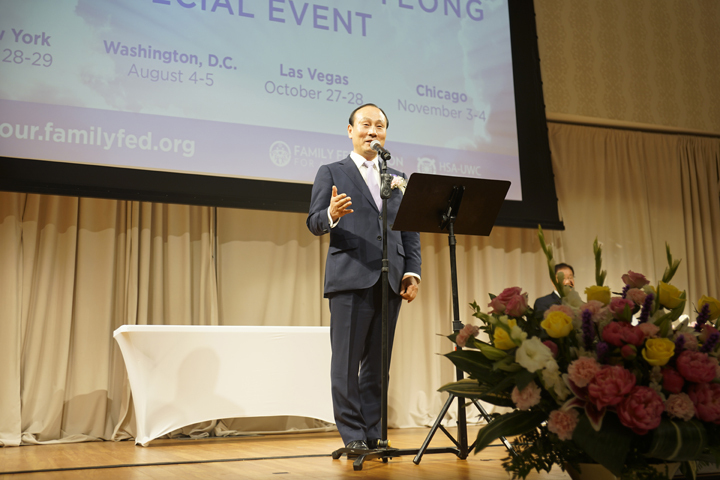 Lee delivered True Parents’ message under the theme, “Let us walk the path of hyojeong with divine spirit and truth.” by saying, “Depending on how grateful and loyal you are to heaven, you will see amazing growth and development.” This RRHMF was for members to make a resolution for the victory of the HTM mission. It prepared the way for the 2018 RRHMF of FFWPU for a HK Region 5, to hold their event on May 27; and for the following events held by Region 4, Region 3, and Region 2. Each rally was held successfully, with 10,000~20,000 participants at the CSPWC. With each rally, members could take part in the following events: chanyang, offering HOPs, and CIG Hyojeong Won Inheritance Ceremony. 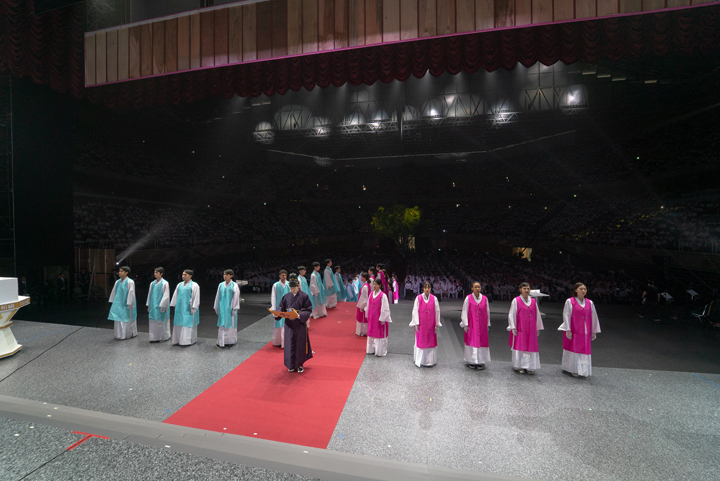 True Parents delivered their precious words, officiated at each rally and blessed each region with their new names: Heavenly Gyeongsang Guk (Region 5), Heavenly Jeollaguk (Region 4), Heavenly Chungcheong Guk (Region 3), and Heavenly Gyeongwon Guk (Region 2). In order to make a life-or-death decision and invest everything we have, each region held a Hyojeong CP HTM Special Workshop (WS). Centering around a group of members who completed their missions as HTMs to bless 430 couples, the prayer vigils were held at CPTC every night with our members’ great passion. The 2018 Asia-Pacific 21-day Top Gun WS officiated by True Parents was held for 21 days from Jan. 9~29 with 67 participants. Also, on Feb. 17, for 10 days, after listening to True Parents’ Life Course and CP Lectures, 494 Japan Top Gun College trainees became one with hyojeong when they were able to clearly recognize True Parents’ status. 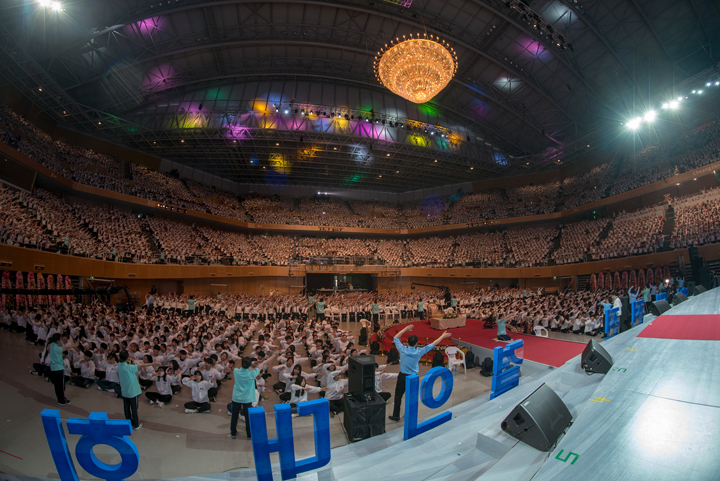 The Korean Seonghwa Students General Assembly was held on Jan.16 for 3 days with 2,000 seonghwa students and seonghwa teachers. The WS for Korean Senior High School Students was held from Feb. 9 for 4 days with 730 participants. All the students preparing for college entrance were informed that the value of life according to True Parents’ wishes is the most important thing; that they should earnestly study the principles to overcome the temptations of the secular world. Korean and Japanese Seonghwa Students WSs were mainly held during the summer and winter vacations with programs such as mentoring camps for studying and DP WSs. The 2018 Azalea Festival Hyojeong CP GW attracted 38,000 participants from 55 nations around the world to Hyojeong Cheonwon (HC). The festival took place for 3 days, from May 4 to 6, during the beautiful spring season. On the 1st day, Intl. Pres. Sun-jin Moon welcomed all the participants, saying, “We all have one nationality— CIG! —so this is a hometown for all of us.” On the 2nd day, the Hyojeong Intl. Azalea Festival was held in the CSPWC. During this event, the Hyojeong Multicultural Peace Festival, the Hyojeong Prayer Wish-Offering Ceremony for Restoration to Inherit Heavenly Fortune, and the Hyojeong Cultural Festival to Commemorate the 10th Anniversary of Hyo-jin Moon’s Ascension were poignantly conducted in attendance to True Parents. All BF from 55 countries made a resolution to accomplish the HTM mission with hyojeong. It was a precious time for them to become one in shimjeong with True Parents. 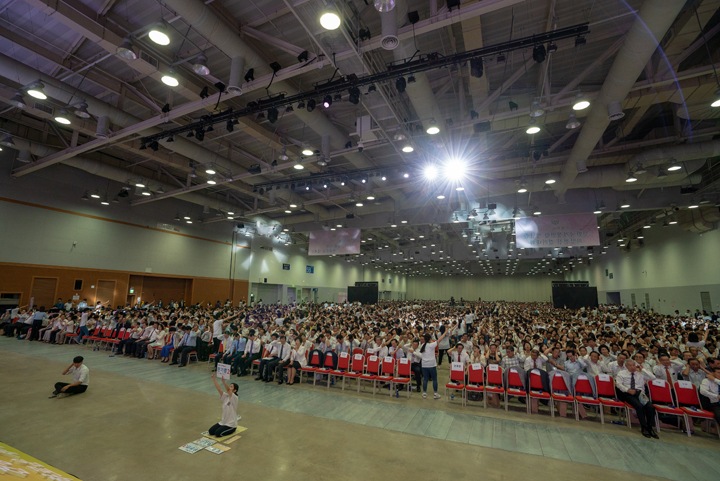 On Aug. 26~28, the Hyojeong CP GW Commemorating the 6th Anniversary of the Holy Ascension of Sun Myung Moon, the True Parent of Heaven Earth and Humankind, was held with 53,000 members attending from 78 countries. True Parents blessed all the participants to become the light of the world through hyojeong. Pres. Lee said, “True Father, who has the authority of Heaven, and True Mother, who has the authority of the earth, have completed the era now that the substantial Holy Spirit is mobilized.” He hopes that we can resonate with the hyojeong that our elder brothers Hyo-jin nim and Heung-jin nim (in the Jeongshim Won) had for their Parents. On the 2nd day, the Fulfillment of Wishes Prayer and chanyang, which was held 7 times, accelerated the enthusiastic atmosphere at the event. Intl. Pres. Sun Jin Moon’s Special Lecture was held on the 1st day; the 2018 Hyojeong Cosmic Blessing Ceremony officiated by True Parents, ABC for 1~322 gen. and the Blessing Ceremony for Unmarried 1st Generation Spirits (BCUGS) were held at the height of the Seonghwa Festival. On the 3rd day, the Dedication Ceremony (DC) for the CheonBo Won, in attendance to True Parents, was held with amazing grace. On March 25, 2017, True Mother gave her words at the Tree of Love plaza about building the CheonBo Won. 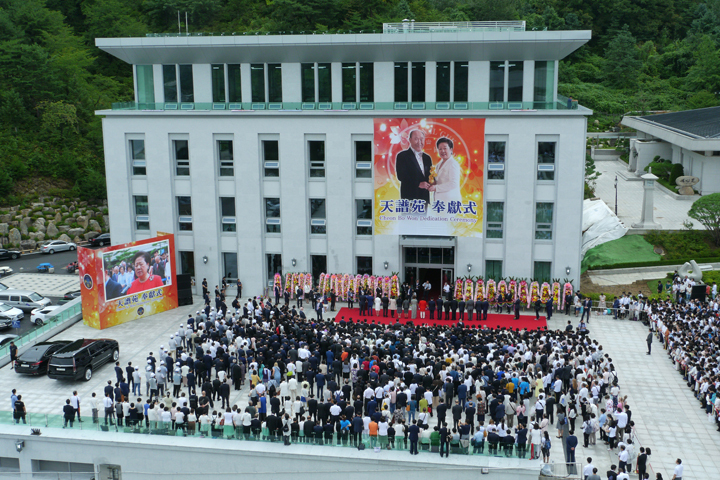 True Mother gave an official statement of building the CheonBo Won at the National Pastors Assembly for the Victory of the Fifth Year of CIG (March 29, 2017) by saying, “BF on earth must fulfill their responsibilities and ancestors in the spirit world must be liberated.” With earnest attention, she offered devotion as she looked around the construction site several times. 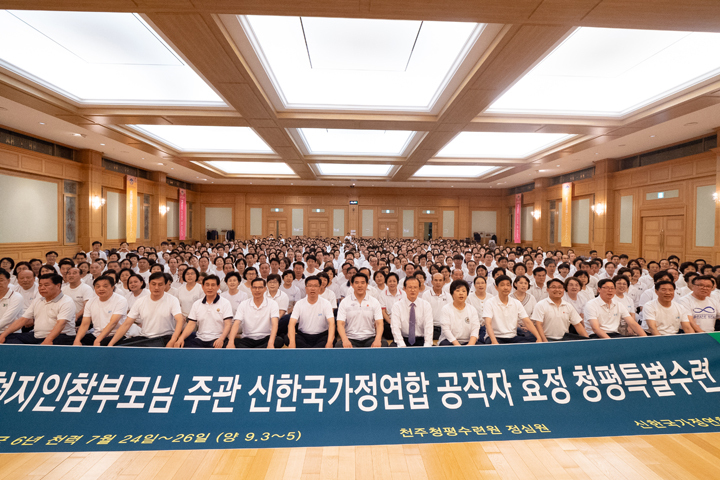 Before long, the 3rd day of the Hyojeong CP GW Commemorating the 6th Anniversary of the Holy Ascension of Sun Myung Moon, the True Parent of Heaven Earth and Humankind (Aug. 28, 2018) arrived; the CheonBo Won, in which records of our member’s accomplishments and achievements are kept, was dedicated to Heavenly Parent. With the DC for the CheonBo Won, which was held in attendance to True Parents, many members from around the world received a lot of grace. 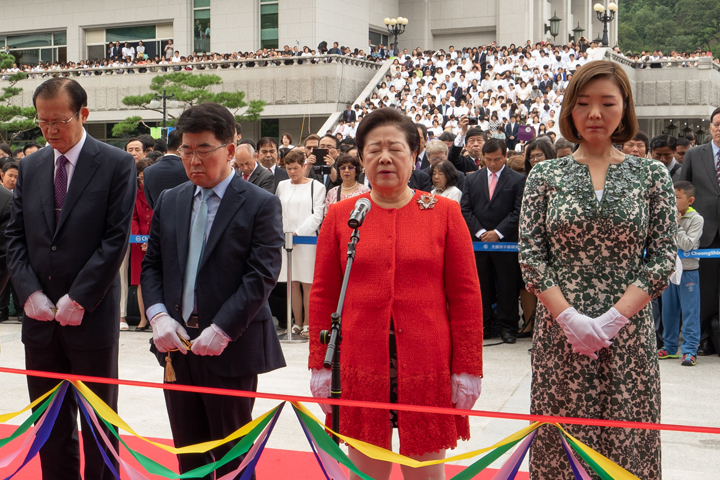 True Parents’ gave the benediction prayer as follows: “In all the days to come, may this become a hall in which a legacy may remain telling the proud story of the unblemished forefathers and ancestors that cast no shadow.” On the morning of the same day, the Victory Celebration of the DC for the CheonBo Won was held. Unificationists strengthened their resolve to fulfill their goals and responsibilities as HTMs; they determined to bless 430 couples horizontally and 430 gen. of ancestors vertically so that they could register their names in the CheonBo Won and accomplish the settlement of CIG. 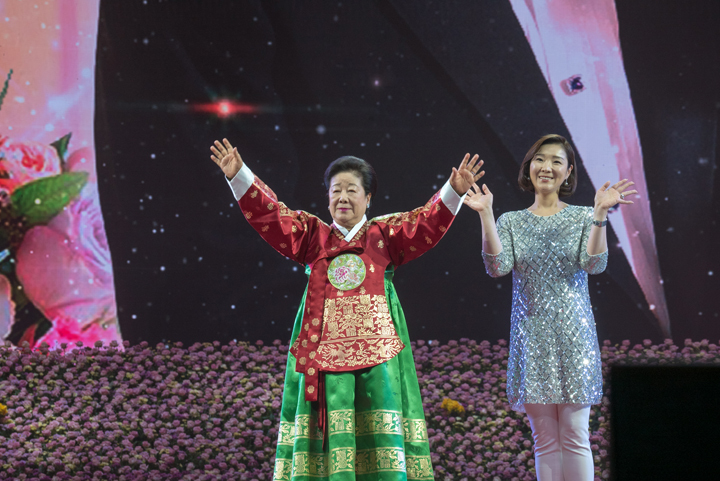 On Aug. 28, during the Victory Celebration of the 2018 Hyojeong Cosmic Blessing Ceremony officiated by True Parents, True Mother spoke to the CIG Leaders; she asked all to attend a WS to empty themselves completely and be reborn through the substantial Holy Spirit. They continued their sincere devotion throughout the Hyojeong CP Special WS under the banner of purifying themselves, in the form of pure white and pure gold, and being absolutely united with True Mother. 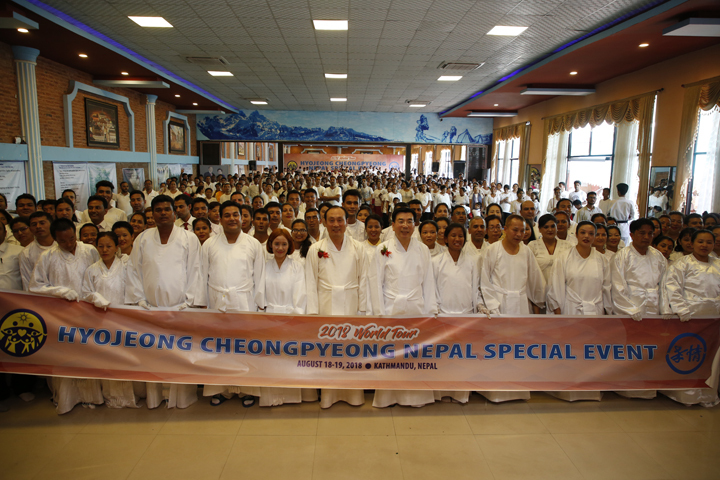 On Aug. 28~30 and Sept. 3~5, True Parents officiated the Hyojeong CP Special WS for Church Leaders. 700 world leaders participated in each WS centering on FFWPU for a HK. Also, on Sept. 13~15, along with Pres. 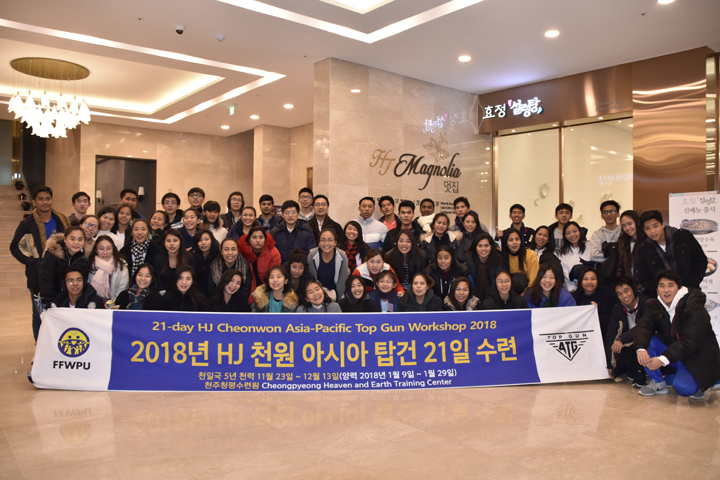 of the UPF Korea, Yeon-ah Moon, 148 leaders participated in the Hyojeong CP Special WS for Leaders of Providential Institutes. The Hyojeong CP Special WS for FFWPU Heavenly Japanese Leaders was conducted on Sept. 21~23, with 444 participants who were mainly Japanese pastors. 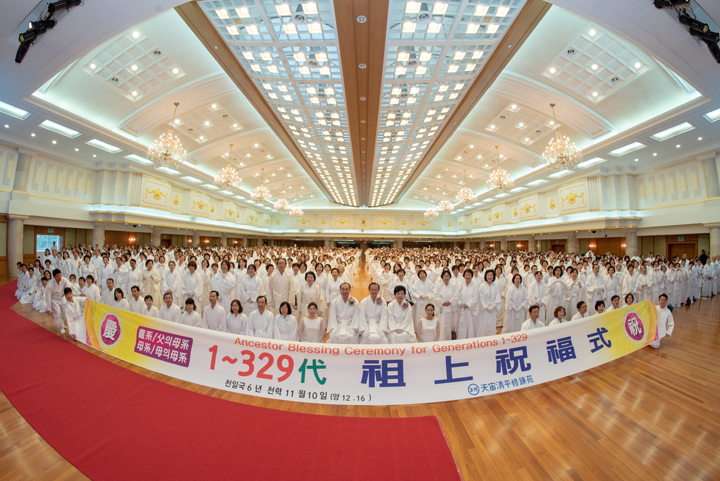 Also, on Nov. 1~3, a group of 461 Japanese leaders who were mainly Chairwomen of the Women’s Guild attended and offered sincere devotion to enter the realm of unification with True Parents. Lastly on Oct. 28~31, about 300 elder pastors who had been deeply loyal and sincere to True Parents also attended the Hyojeong CP Special WS for a HK Elder Pastors. They pledged to serve loyally as a deep-rooted tree in the Unificationist family. During the blessed season of bearing abundant fruits, on Oct. 19~21, 37,000 members from 62 countries participated in the 2018 Autumn Hyojeong CP GW. In the midst of the various programs, True Parents visited 4 times. 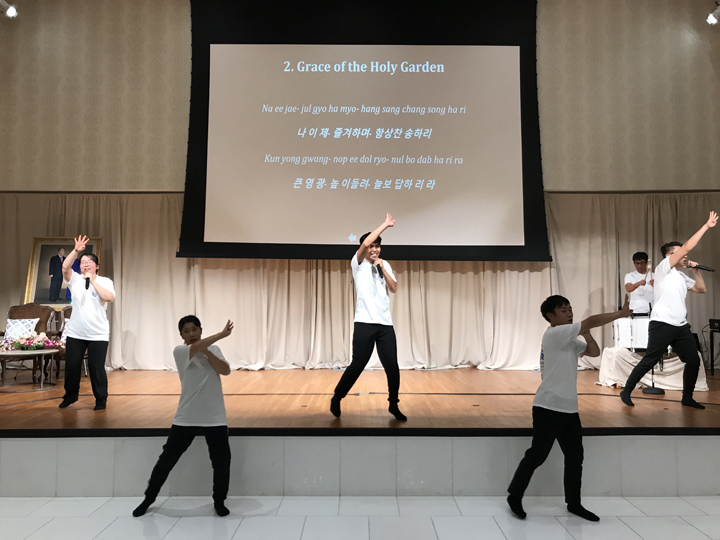 On the 1st day (Oct. 19), True Parents encouraged the missionaries with their precious words at a Special Gathering of Japanese Missionaries in Korea. On the 2nd day, True Parents directly officiated the Intl. Drone Expo, the Hyojeong Offering Ceremony, and the YSP Hyojeong Intl. Peace Youth Music Contest. True Parents’ grace revived us from deep within. All the participants felt their love. 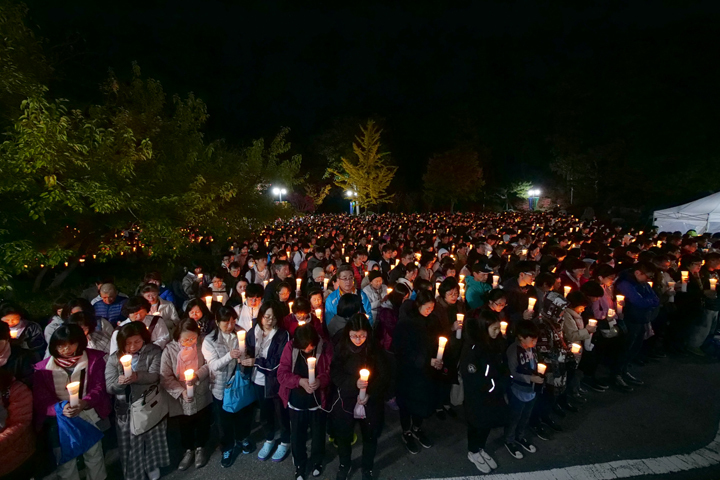 The 2nd evening, many members attended the Tree of All Things Prayer and made a resolution to become the light of hyojeong, like the beautiful light of the holy candle they inherited. In 2018 CP, there were more passionate voices from chanyang and prayer than ever before. CP welcomed 1,794 people from 39 countries who joined the Hyojeong CP 40-day WSs, held 8 times from the 220th to the 227th sessions. There were a total of 51 2-day WSs held from the 1403rd to the 1453rd sessions. Not including those who came to the GW, 127,511 people participated. They received great grace from the ALC for 1-378 gen., the ABC for 1-329 gen. and the BCUGS which was held after last year. Through all of these events, many couples were created between the spirit and physical worlds. Various WSs for VIPs and new members were held at the Chinhwa Education Building B where participants could visit the HC CP Holy Ground with grateful minds. The result was more than last year; through 181 separate occasions, there were 17,616 people who participated. In Nov., we had already reached 210,000 trainees, which had been the goal for the year 2018. A significant accomplishment was also made in hosting a total of 242,000 trainees by the end of the year (Dec. 30, 2018). This means that by the end of the year, the total number of trainees had risen to 38.7 percent above that of last year. True Mother gave us special grace to bless our ancestors up to 430 gen. by the FD of the year 2020. In Dec, new gen. of ancestors were opened up for liberation; the number of gen. eligible expanded from one (7 gen.) to seven sets (49 gen.). This makes it possible for people who haven’t liberated their ancestors to have another chance to complete the entire course up to 378 gen. The 6th year of CIG, 2018 was the year of great achievement for the providence with the launch of the heavenly nations and regions. True Parents’ light of hyojeong was released all over the world, guiding all of the people to the victory of Vision 2020. The miracle of CW is spreading like a fire all over the world by making impossible things possible and unifying members with True Parents. CPTC will contribute to completing the HTM mission by speeding up its progress and fulfilling the hope of all the BF; it will attend the substantial Heavenly Parent as we go towards the settlement of the Heavenly World.